Senran Kagura: Peach Beach Splash, developed by Tamsoft and published by Marvelous, is the latest entry in the innuendo-laden Senran Kagura series. In Senran Kagura: Peach Beach Splash the characters trade their weapons and ninja arts for water guns as the series becomes a third person shooter with the characters entering the water gun tournament known as Peach Beach Splash. The story of Senran Kagura: Peach Beach Splash continues on from the last Senran Kagura game, Senran Kagura: Estival Versus where the girls learned of the existence of the currently sealed world destroying giant Yoma known as Shin. Despite being sealed Shin is beginning to have an effect on the world with the most notable being that the summer heat has persisted into the winter months. Despite, the increased heat, the world continues to be peaceful with the game’s various characters making the most of the good weather, but as they enjoy the weather they are summoned and transported to a remote island to take part in a water-gun tournament called Peach Beach Splash with the winning team getting the one thing they want in the world. The tournament, for the most part, is pretty mundane with the story broken up into six arcs, one arc for each individual teams: Hanzo Academy, Crimson Squad, Hebjio Academy and Gessen Academy, and the final two arcs are the resolution portion of the story. The overall story is a straightforward experience that shows to what lengths some of the leading Shinobi are willing to go to in order to deal with Shin. Like previous Senran Kagura games, Peach Beach Splash mostly focuses on the four separate teams and the character dynamics within them. When it comes to the game’s characters, they are similar to how they were in previous Senran Kagura games, although Peach Beach Splash does give new personalities and challenges to each character and team. If Senran Kagura: Peach Beach Splash is your first Senran Kagura game, the game does a great job of explaining the characters and team motivations. Senran Kagura: Peach Beach Splash moves away from the series’ staple hack and slash action to one of a water-gun based third person shooter. The change in genre can feel jarring at the beginning, but the developers have done an amazing job of making the transition in combat style as smooth as possible. Although, while the transition to a shooter from a hack and slash game is relatively smooth, the developers did make the shooting element a bit easy. I say a bit easy as the game feature a very gracious lock-on aim-assist that can at times feel like an auto-aim because once you lock onto an enemy your gun will automatically track them for as long as you remain locked on. If you don’t want the auto-aim, you can disable or re-enable it during gameplay. For those wondering about weapon variety, the game offers ten different weapons, including an assault rifle, dual pistol, shower gun and Gatling gun. The inclusion of a gracious auto-assist allows the jet based movement system to shine as you can use your water to propel yourself high into the air or to dash across the battlefield for an easy escape from overwhelming numbers or to chase down a marked target. 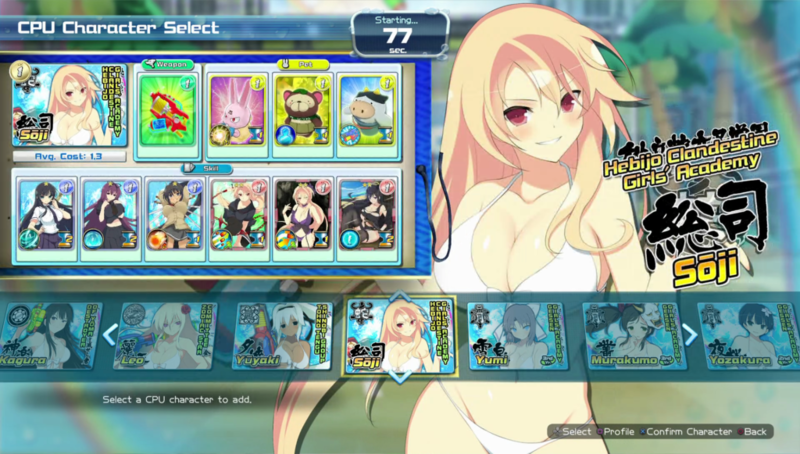 Besides the third person shooter elements, PBS features a card system similar to that of the loadout system seen in many first and third person shooters. When entering battle you are given a choice of weapon, three pet cards and a choice of six cards. The cards system allows players to activate offensive or defensive skills during a match; you have access to three cards at a time with a new one becoming available following the use of any of the three cards in your hand. It is also worth noting that all the cards are multi-use. The card system is rather flashy, but it does its job. While it is built around helping players, I can see it appealing to some card collection fans as there are over 800 cards to unlock and to gain new cards you need collect booster packs, which are rewards from missions or purchased with in-game money. The card system also allows players to play a more defined role in battle as the game does not have a class-based system. Overall the combat is enjoyable, with the water-gun theme and card loadouts making it stand out. The auto-aim and the almost constant need to reload is an annoyance, but it doesn’t ruin the experience. When it comes to game modes, Senran Kagura: Peach Beach Splash offers three single-player modes and three multiplayer modes. Single player consists of a story mode, paradise episodes, which are side-stories that last roughly about 5 missions each, and V-road challenge, which is a multiple round knockout tournament that resets to the beginning when you leave. The multiplayer consists of ranked and unranked 3v3 and 5v5 matches, and a co-op survival mode. The single-player modes offer great replay value as missions reward you with in-game currency and a booster pack containing ten random cards. In terms of the multiplayer, it is difficult to say because every time I went to queue there never seemed to be anyone playing. Now, before talking about my issues with the game, it wouldn’t be a Senran Kagura game without innuendos, and for those who love them Senran Kagura: Peach Beach Splash is packed to the brim with them. The innuendos can be seen in the conversations between characters and in the names of missions, for example, the first mission in the Hanzo arc is called “Grip softly to squirt”. The game also allows you to get up close and personal with the game’s female characters in the dressing room/shower where you can dress up the characters and cosy up to them with a nice rub down followed by a kiss. Of course, combat isn’t exempt from the sexual content because not only are all characters wearing bikinis but upon defeating a named character you can humiliate them by using the Peep-Peep weapon to wash part of their bikini away. If you don’t like the sexual innuendos then this is most definitely not the game or even series for you. In regards to major issues, the game suffers from some noticeable frame stuttering when engaging a large number of enemies. I say some noticeable as it isn’t a regular occurrence, but when it does occur it is very much noticeable and annoying. Senran Kagura: Peach Beach Splash is a fun relaxing water-gun based third person shooter that offers an intriguing card based loadout system. The game also continues the franchises’ great character-focused stories and innuendo laded content. For more information on Senran Kagura: Peach Beach Splash, visit https://marvelousgames.com/.